Home > Buying Tickets > Who are the Ethical Ticket Sellers? Fans of popular acts are too often faced with either buying concert tickets from touts for inflated prices or missing out altogether. Who are the ethical ticket sellers and can they help they turn the tides? There is nothing untoward about concert tickets selling out shortly after they become available, but when many then appear on sale on eBay at grossly inflated prices it’s apparent that something is rotten in the world of online ticket sales. Nowadays anybody can buy a handful of tickets for a sell-out show, keep one for them self and then make money on the rest by selling them at a higher price to the fans that weren’t so quick. Online auction sites like eBay mean that you don’t even have to endure the effort and public scorn involved with hawking them outside the venue itself. Welcome to the world of the bedroom ticket tout. What can Genuine Fans do to Beat the Touts? The ease with which a ticket tout can now ply his trade means the practise has become depressingly widespread. If there’s a sell-out gig in your town tonight, chances are a large number of attendees will have paid over the odds for their ticket. What’s more, many more genuine fans will be sat at home having missed out altogether, being unable or unwilling to pay the price hike. So, if you’re a fan who can’t get hold of a ticket, how can you beat the touts and get one without being fleeced? One increasingly popular option is to give eBay a wide berth and instead turn to the ‘ethical ticket sellers’. These online services promote goodwill by allowing fans to buy and sell second-hand tickets on at face value. Instead of buying your ticket from somebody who is out to exploit your desperation for a handsome profit, ethical ticket sellers allow you to purchase it from someone who genuinely can’t use theirs. Describing itself as a ‘free ticket-exchange service for Music Festivals and Concerts’, Scarlet Mist is one such ethical ticket seller and the first of its kind. It was set up in 2003 to help a friend get a Glastonbury ticket, and has since gone on to help thousands more nationwide get hold of that elusive ticket. The basic idea is that you let the site know whether you have a ticket to sell or are looking to buy one, and they try to match you up with somebody local to you. Once an agreement is made, names, emails and phone numbers are exchanged so that the transaction can then be made. It is not entirely risk free and relies on the trust of the users. To aid fair play Scarlet Mist tries to match up users up geographically so that buyer and seller can meet face to face and exchange cash, or recommends the use of an escrow service. 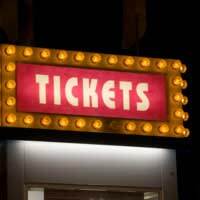 In order to prevent somebody buying a ticket at face value using the site and then selling it on, it is advised that all sellers write SCARLET MIST in bold on the back before it is sold. Hopefully then if a future buyer spots the name they’ll realise they are being cheated and contact Scarlet Mist to get the seller reprimanded.